T-Bone awoke with the sensation of lying on something hard. He winced and opened his eyes and beheld a very strange sight indeed, finding himself looking up vertically at the entrance to Dark Kat’s laboratory, and the ship’s control room beyond. Ugh, he thought, twisting a bit in place, did I hit my head harder than I thought? Why is everything topsy-turvy? And, what am I lying on? He sat up as much as he could, and then realized what was going on: the Fear Ship was on its side and he was actually sitting in the great black throne of Dark Kat himself, which had fallen down into the lab. Somehow it’d landed perfectly up against the back, now bottom, wall of the room, and the SWAT Kat’s fall had been more or less broken by it when he’d fallen. To either side of him were the jumbled, broken remains of all of Dark Kat’s scientific equipment. Lurching up, T-Bone struggled to remain conscious. He had to get back to Razor and the others. To Lieutenant Feral. And, he had to get Dark Kat, he reminded himself, clenching one hand weakly into a fist. He began the arduous climb up through the sideways room, thanking heaven for the fact Big D had seen fit to bolt some of the furniture and equipment to the floor, providing convenient handholds for the dazed SWAT Kat. By the time he’d scaled the short flight of steps leading to the lab door, gripping either side of the frame, his head had cleared, although his body, particularly his back where he’d hit the throne, still ached. Dang, he thought, did that big purple jerk have to have such an uncomfortable throne? Oh well. He picked his way through the smashed control room, eager to reunite with his friend and the others. He had to get back in the game. Like him, he knew Dark Kat was down but not out. Just because his ship had crashed didn’t mean their arch-enemy didn’t have some further trick to destroy Megakat City up his sleeve. And, he was soon to find out how right he was. Razor sat on the outside of the ship, a war of emotions broiling inside of him. His friend. No, his brother. Gone. All thanks to Dark Kat. Nearby, Felina stood nearby, unwilling to leave his side. Zeckis, the technician who’d turned against their enemy, was picking his way down the exterior of the hulk, apparently eager to get as far away from his former master’s crashed vessel as possible. Razor didn’t blame him and would’ve loved to have walked away himself, but he didn’t want to just yet. He wanted to sit here a little while longer. He thought back to when he and Chance had first met in the Enforcer Academy. Never in a million years had Jake Clawson imagined he’d become lifelong friends with the hot-tempered, frankly juvenile tom their drill instructor had partnered him with for the duration of their training. And yet somehow, despite having very little in common, the two had become fast friends. So much so that Jake had sacrificed everything for Chance. When cyber crimes tried to headhunt him out of training, he’d turned them down, choosing to become a patrolman with Chance. When Chance finally got his wish to join the air division, Jake had gone with him to be his gunner and navigator. And, when Feral had thrown them out, Jake had gone with him then, too. Not that he’d had much choice, of course; Feral had fired both of them. But, Razor reflected, had Feral fired only Chance, he was sure, deep down, he would’ve quit to go with his best friend. And then, they’d become SWAT Kats together. And now, T-Bone – Chance – was gone. Razor felt tears welling up in his eyes. Razor and Felina turned. T-Bone was poking up out of the opening that had once been the front viewport of the Fear Ship’s control room. Bruised, battered, bloodied, his suit torn in some places, but alive. Razor leaped up and ran over, helping his friend climb out. He was relieved beyond words and felt like kissing T-Bone, but refrained. No need to get too mushy. His friend was alive now, and that was all that mattered. Now it was time to finish Dark Kat. “And, in one piece, too,” said T-Bone, who winced a little, “well, mostly. Always a good day when we manage to crashland without blowing up.” He glanced around. “Where’s the other guy?” he asked. “He split,” said Razor, jerking a thumb in the direction Zeckis had gone. “What say we follow his example?” suggested T-Bone. Everyone paused and listened, hearing the sound of jet engines. Looking around, they saw the Turbokat approaching from the distance. Shocked and overjoyed, T-Bone ran over to the edge of the rocky exterior of the downed airship, pausing as he observed it was a good twenty feet or so to the ground. But, nothing was going to keep him from his baby, and so he began making his way down, following the path Zeckis the technician had taken. Razor and Felina hurried after him. “Yeah, but who’s flyin’ it…?” asked Razor, squinting into the sky. “It’s Uncle Ulysses!” cried Felina. Felina shoved her way between them, hurrying down, overtaking Zeckis, grinning and waving joyously at the approaching jet. She jumped down, landing deftly on her feet. She continued waving, trying to get the Turbokat’s attention. In the cockpit, Feral spotted her and was overjoyed. His niece was safe! He started to wave back, but checked himself and offered a stern salute instead. His niece returned it happily. General Boggs and his lieutenant listened as Feral’s report came through. Steel hovered behind them, acting Mayor Briggs’ orders in the back of his mind. The assembled Enforcer technicians cheered. The technician turned and relayed the order. Boggs turned to leave, only to find his way barred by Lieutenant Commander Steel and a group of Enforcer commandos. “What are you doing…?” the Army officer demanded to know, annoyed. Boggs blinked, speechless, but decided not to press his luck, stepping back wordlessly. A few of his soldiers were present in the operations room, laser rifles slung, and Boggs held up a placating hand, motioning for them to stand down. They surrendered their weapons to the Enforcers without a fight. Steel was right. With Dark Kat’s ship downed, the Army’s work here was done, and it was only fitting that the locals resume their authority. Still, Boggs disliked having to acquiesce to Steel of all people. The General didn’t know him very well, but there was something slimy about the young lieutenant commander Boggs didn’t like. As one, the Enforcer technicians surged forward and retook their stations from the Army personnel, who politely got up from their seats and stood aside, turning the stations back over to their rightful owners. They then stood back, looking defeated but still professional as things returned to normal in the operations room. “And, what about Feral?” Boggs asked, remembering the Enforcer commander’s insubordination. “Remember, he flagrantly disobeyed my orders while I was in command! Or will he be included in that ‘proposal’ Briggs mentioned before…? “We’ll see about that,” said Steel with a gleam in his eye, smirking as he walked past the old General. If in fact Feral’s insubordination charge stuck, he realized, he would become the new commander. There’d always be a challenge from Feral’s niece, who enjoyed more popularity with the rank and file than he did, but Steel decided he’d cross that bridge when he came to it. He chuckled to himself as he surveyed the Enforcer techs performing their duties. Callie became acting mayor, and soon, with luck, he’d become acting commander. Today was definitely a day for big changes. Feral landed the Turbokat. Felina ran to her uncle as he got out of the jet, grateful to be out of the cramped cockpit, and walked over. The two stopped and faced one another. For a moment, neither said anything. After all, the last time they’d spoken face to face, it hadn’t exactly been on the best of terms. Feral’s massive arms opened as though to embrace her, but she stopped him, taking him by the wrists and lowering his arms. He coughed and, after a moment, instead offered another perfunctory salute. “Good to see you alive and well, Lieutenant,” he said, clearly uncomfortable with displays of emotion. “Oh, Uncle…!” said an amused Felina. This last question was directed at Zeckis. The technician in the purple uniform swallowed and meant to take a step forward and confess his involvement, but was stopped by Felina. She smiled and laid a hand on Zeckis’ shoulder. Feral grumped but decided not to press the issue for the moment. Hearing the sound of more jets approaching, he turned and watched as the Army Air Corps began approaching. T-Bone and Razor looked forlorn. “Guess this means it’s back to the slammer for us,” said T-Bone. “Only for the time being,” said Feral after a moment. “What do you mean?” asked Razor. In a secret area of the ship, Dark Kat led his surviving Stalkers to where a large number of fighter jets were stored. They each had “D” insignias on the sides. Most of them had been sitting parked on the floor when the ship crashlanded, and so they were thrown and jumbled across the hangar and irreparably damaged, but several others were suspended by mechanical pincher mechanisms from the ceiling and still hung there safely, eight in all, plus a ninth jet that was larger and more impressive than the others and included a silver shield emblem on either side to go with the “D.” Dark Kat’s personal fighter. The SWAT Kats, the two Ferals and Zeckis heard a rumble and turned. They saw a group of fighters emblazoned with an all too familiar “D” insignia come shooting out of a previously unseen opening in the side of the wrecked horror of a ship, eight or nine of them in all, the biggest one in the lead. “Fighter jets for those mutant creations of his! His own personal air force!” cried Zeckis. As they swooped low overhead, Dark Kat and the Stalkers could be glimpsed through the tinted canopies covering the cockpits. Dark Kat turned and flew back at the group, swooping low and opening up with his jet’s laser cannons. The fire pelted the ground around them, and everyone dived out of the way. Dark Kat circled away to rejoin his squadron as they headed towards the approaching Army jets. The SWAT Kats picked themselves up, glowering at the persistence of their longtime enemy, angry that even with his flying nightmare of an airship downed, Dark Kat was still intent on causing trouble for them. Razor considered a mean remark but decided to keep it to himself. Despite everything he’d done to them since the beginning, from drumming them out of the Enforcers to unmasking them live on TV, Feral had gone to bat for him and T-Bone, had realized only they could stop Dark Kat and admitted it to himself and had even brought them their jet fully loaded. It didn’t quite make up for everything he’d done, but it was enough. If nothing else, it had earned the Commander a reprieve from his rivals’ snark about his competence. He hoped he was right. He did not like leaving people undefended on the ground like this, even if one of them was Feral and the other a guy who until recently had worked for Dark Kat and was still wearing his uniform. But, he had no choice. 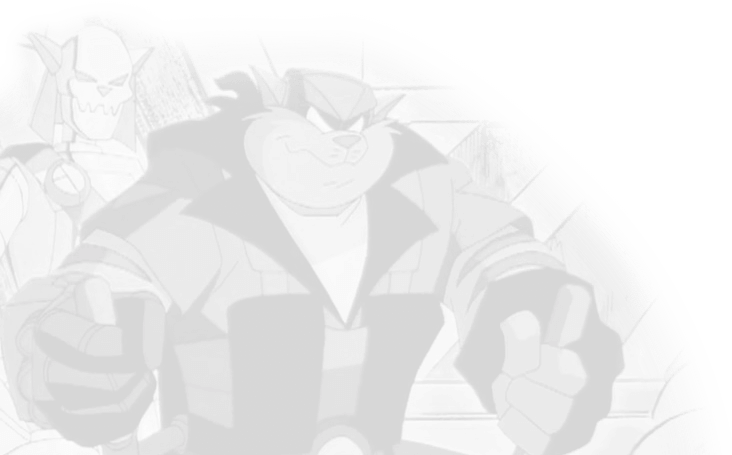 With Dark Kat and his creepy creations in the air, there was nothing the SWAT Kats could do on the ground, and so Razor joined T-Bone in running for the Turbokat. T-Bone nodded and strapped in. The canopy slid shut and the jet lifted off, turned in midair, and began flying off after the villains. Felina looked around and spotted an old farmhouse. “There!” she cried, pointing. The three turned and began running off across the field. He stopped, squinting through the tinted visor of his helmet. An entire squadron of unidentified and possibly enemy aircraft were flying towards them from the wreck of the Fear Ship. In the central operations room at Enforcer Headquarters, Boggs and most of his relieved men were gone. Where, Steel didn’t care. He was in command now, and that was all that mattered. An Army lieutenant and an Army technician manning the radio were still present on account of there still being an Army fighter squadron in the field. But, with Steel overseeing things and Sergeant Talon at his side, it was still an Enforcer-run control room once more. The two remaining Army personnel would leave as soon as the squadron returned. It felt so good to be running the show that Steel didn’t even mind the distrustful looks Talon was giving him. He knew the Sergeant respected the chain of command and would follow his orders. So as long as Feral’s lackey kept his comments to himself Steel was fine with Talon’s opinion of him. Callie Briggs observed the change with some satisfaction when she returned, D.A. Mills trailing after her. She turned and spoke to Steel. “Good work, Lieutenant Commander,” she said. Steel would’ve preferred “Acting Commander,” but Feral was still nominally in charge even if he hadn’t ben formally disciplined and removed from command for disobeying Boggs. Besides, it’d been a long time since anyone had told Steel he was doing a good job, so he counted his blessings. “Thank you,” he said and meant it. Callie didn’t get a chance to start in on whatever it was she was going to say because the Army lieutenant over by the radio said “Uh-oh!” in alarm. “What is it?” asked Callie, looking over. Talon left Steel’s side and walked over. He and the lieutenant exchanged a few words. “It looks like the fight isn’t over yet,” said the Sergeant after a moment. “Enemy fighters approaching fast!” announced the Army technician, consulting the big screen above them. Steel shoved himself between him and Talon. He was in charge here. “Identification?” he asked, glancing at a female Enforcer technician sitting nearby. “Put the squadron leader on!” ordered Callie. Steel tensed. Briggs would never give orders here if Feral stood in his place. The Deputy Mayor couldn’t tell the commander of the Enforcers what to do. The lieutenant commander was a different story. But, since she was acting mayor until – if – Manx returned, Steel allowed it. He did hope Manx returned. Manx was a craven fool, but Steel would prefer taking his orders from him and not Briggs, who he’d never liked, and one look at her, where their eyes met, confirmed that the feeling was mutual. As for Callie, she hadn’t asked for this. Despite her frequent criticisms of Manx, she preferred being deputy mayor. Having responsibility for the entire city was a weight she wasn’t entirely sure her shoulders could bear. But, she didn’t want Manx back. Not after what he’d said, what he’d done. He’d thrown the SWAT Kats under the bus and abandoned Megakat City. Come what may, whether she became mayor permanently or whether someone else got elected, Callie did not want Manx back under any circumstances. As she glared at Steel, she realized she wanted Feral back, though; whatever their differences, he was still better than Steel. The tense moment passed, and Steel stood aside out of her way as she approached, the Army technician flicking a switch so that they could hear the voice of the lead Army pilot. An aerial battle ensued. The Stalker fighters flew in amongst the Army Air Corps, and they began exchanging fire. Although the Army jets outnumbered the Stalkers, the enemy fighters quickly began making short work of their foes. Olive green jets, trailing smoke, began to spiral down out of the sky and explode on the ground. Soon, only three Army jets remained, including Black Falcon’s. A Stalker closed on one of them, its terrified pilot desperately trying to shake his pursuer. The Stalker growled, targeting him, firing a missile. It sailed towards the Army pilot, only to be blown up in midair before hitting its target. The Stalker snarled in surprise before it, too, was struck, its jet exploding in a fireball. Dark Kat, observing, was equally surprised, watching as suddenly the Turbokat flew into the fray, blasting away with its missiles. “The SWAT Kats!” he growled, clenching a fist. “I’ll destroy you two once and for all, myself!” Dark Kat snarled back. He flew off after them, but lost them amidst the chaos of the aerial fighting. T-Bone expertly zipped in and out among the smaller jets flown by the Stalkers, allowing Razor to target and destroy two of them. The Stalkers shrieked and screamed as their aircraft exploded in midair, leaving six enemy craft, including Dark Kat. This, he thought, was what the SWAT Kats did best. It wasn’t by the book, but it worked. T-Bone got on the radio to the leader of the Army pilots. “Black Falcon!” came the voice over the radio. The three remaining Army jets joined up and began flying closer to the Turbokat. In Enforcer Headquarters, everyone watched the battle playing out on the big viewscreen, with three green dots representing the Army, six purple dots representing the enemy and a single blue dot representing the SWAT Kats. Callie frowned. The good guys were outnumbered. And, as much faith as she had in the SWAT Kats, she decided it was time to even the odds. She turned to Steel. “Get some Enforcer jets into the air to assist them!” she ordered. On the runway, alarms blared as Enforcer pilots ran and got into their jets and began taking off. He fired. Slicer Missiles headed towards the enemy jet, the three blades unfurling. Just as the Stalker was about to fire, the Slicers cut into its jet, lopping off the right wing. The Stalker screamed as its jet spun wildly out of control, then crashed and exploded far below. He never finished. He was cut off as a missile came flying in and broadsided him. His jet exploded in a massive fireball, and he was gone. T-Bone and Razor were shocked and horrified. They had barely known Black Falcon, but the sudden death of a fellow pilot shook them both. “What the-? !” cried T-Bone, wondering where the missile had come from. His jet banked in to fly alongside them. The enemies glared hatefully at one another from their respective aircraft. Razor said nothing. He sat silently in the backseat, his mouth set in a grim line. He banked away from them, and T-Bone pursued. “He has to die!” T-Bone insisted. Still, there was no reply from Razor, who closed his eyes. Razor’s eyes slowly opened. Just this once. He sighed. “Agreed, but this is the only time!” he said. It wasn’t like the SWAT Kats hadn’t killed their enemies before. Their evil selves from the alternate dimension and Mutilor’s surviving crew could attest to that. 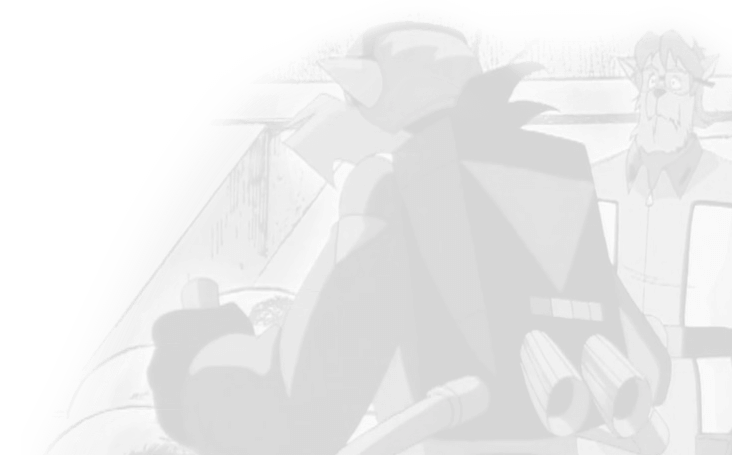 But, those had been either indirect or in self-defense… deliberately pursuing and killing an enemy was something Razor was ordinarily against, but as T-Bone had said, Dark Crud had made it clear he was not giving up and was just going to go on killing until the SWAT Kats – or somebody – stopped him. Permanently. Down on the ground, Feral, Felina and a very distressed-looking Zeckis peeked out from behind a bale of hay over by the farmhouse. “The SWAT Kats are outnumbered…” Feral observed. He didn’t quite know how to feel about that. “Maybe you can be! And, so can I!” Felina said. She turned and pointed to a large force of approaching Enforcer jets.